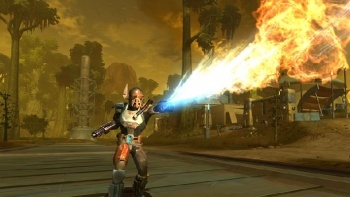 If you plan on downloading The Old Republic, then get ready to cozy up to EA's version of Steam, because it's the only place on the internet you'll be able to get it. In what amounts to a preview of its Monday E3 press conference, EA recently told The Wall Street Journal about its plans to establish a game download service along the lines of Valve's Steam service or Gamestop's Impulse service. The service, called Origin, will go live with over 150 games ready for purchase and download. While that's a respectable number for a brand new service, EA has another trick up its sleeve to help draw in the PC gaming crowd: the much awaited MMO Star Wars: The Old Republic will only be available for download from Origin. So unless you want to go out and physically purchase the game in disk form, Origin is pretty much the only way to get it. In addition to game downloads, Origin will be packing a robust social networking aspect and some sort of cross-platform integration, allowing the play of mobile or social versions of a game to impact the core game. One example that EA's Senior VP of Global Online, David DeMartini, gave was playing a Battlefield minigame on your phone, earning experience that could be used in the console version of the game (he specifically mentioned the 360). Now, competition is generally a good thing. So long as companies have to struggle to prove their products worth the consumer's money, they have to offer better services at lower prices. So in that way, another download service it great. On the flip side, if every company decides to keep its games exclusive to its own download service, then while the games may be competing, the services themselves will stagnate, so in that way another download service could be a sign of terrible things to come. However, EA has not said that it will be pulling its games from any other download service, and making SWTOR an Origin exclusive may well be a one-time, lets-get-off-on-the-right-foot sort of thing. Chances are, we'll find out more Monday.